Accessory for Studer Xtender (XTM3500-24, EELEINVTST3.5). Measures precisely the State of Charge (SoC in %) of the connected battery, in order to have a precise idea of how much energy remains available. The shunt measuring resistor allows to record all the charge (in Ah) that went into and has left the battery, regardless of how many chargers and inverters are connected. 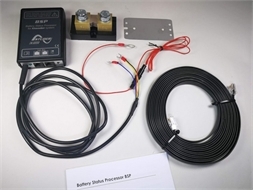 The BSP500 uses the RCC-02 to set the configuration (namely battery nominal capacity) and to display the current values (State of charge, Energy throughput, battery temperature, battery current, etc.). If there is a BTS-01 connected to the system, the temperature will be measured by the BTS-01 only, if no BTS-01 is connected, the BSP500 will measure the temperature.